The Streamline Moderne exterior of the Academy Theater, designed by S. Charles Lee in 1939. Streamline Moderne, sometimes referred to by either name alone, was a late branch of the Art Deco style. The style emphasized flowing forms, long horizontal lines, and sometimes nautical elements (such as railings and porthole windows). It reached its height in 1937. The buildings in Frank Capra's 1937 movie Lost Horizon, designed by Stephen Goosson, exemplify the soothing style. From the early 1930s through into the 1950s, in the United States a design style flourished that has become known as the Streamline Style. Its most important characteristics are the closed, streamlined forms that strongly suggest speed, symbolic of the dynamism of modern times. This style dangled the promise before consumers, racked by the economic crisis, that they were still on the way to a glorious future with prosperity for everybody, at least if they continued to consume. With its explicit reference to the new, utopian future, the Streamline Style was the symbol of the American Dream, which seemed to be coming true over those decades. 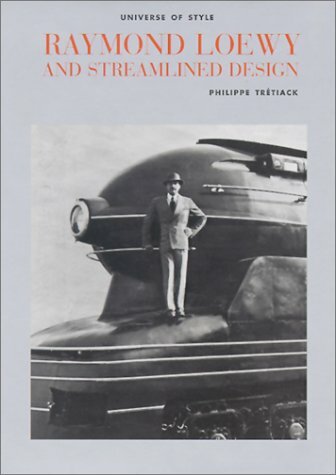 The Streamline Style stood for mobility, speed, efficiency, luxury and hygiene, all concepts that were identified with modernity. To visualise this, the sharp corners and transitions of objects were rounded off. Knobs, handles and hand grips were recessed, to give the object a closed appearance. Speed lines were created by introducing ribs or gleaming chrome strips. This design was not arrived at on the basis of scientific requirements for optimal air flow, but was a cliched expression of that, like one could also see in the comic strips with space heros such as Flash Gordon. Thus, irrespective of their function or content, objects were made attractive and tempting in a way that everyone understood. An iron was given the shape of a bow wave, the design of a pencil sharpener almost makes it more suitable for a speed trial than simple office work, a seltzer water dispenser is transformed into a space capsule avant la lettre, and plates and bowls appear designed to fly back and forth between the refrigerator and the table. Particularly radios, the new product of the era, are important examples of the high-spirited, emphatically positive Streamline Style in a period in which mass consumption was uncritically embraced. Many diverse examples of the Streamline Style, varying from pencil sharpeners to vacuum cleaners and from lawn sprinklers to an Air Stream caravan, are to be seen in the Stedelijk'sexhibition, from the hands of well-known and less familiar industrial designers, among them Norman Bel Geddes, Walter Dorwin Teague , Henry Dreyfuss and Raymond Loewy. The designs and products in the exhibition are from collections both in The Netherlands and other countries. Although the Streamline Style never pervaded design in Europe to the degree it did in America, this typically American style certainly made its influence felt, more in some countries than in others. The exhibition also examines this diffusion process. From car to train design to product packaging, Raymond Loewy has left an indelibly stamp on American culture. Over the 70 years of his career, Loewy, known for streamlined design, created mythical objects which came to be associated with the very image of America itself: The Coca-Cola bottle and truck, the Greyhound bus, the package of Lucky Strike cigarettes, the Studebaker automobile, and much more. This remarkable book recounts the hidden, captivating story of a key figure in the history of American design and includes period and current photos of his most notable designs. The Brooklyn Museum of Art presents a reprint of the catalogue to its benchmark 1986 exhibit The Machine Age in America: 1918-1941 by scholars Richard Guy Wilson, Dianne H. Pilgrim and Dickran Tashjian. Following on the culture-crit assertion that "the machine in all its many manifestations was the defining force in America during the years between the two great wars," the authors trace the era's aesthetic qualities in Buicks, Frank Lloyd Wright houses, Oskar J. Hansen's Ayn Randian sculpture Winged Figures of the Republic on the Hoover Dam, Berenice Abbott's photographs of steamships, Electrolux vacuum cleaners, Russell Wright's seminal flatware and furniture designs, Joseph Stella's vivid abstractions of the Brooklyn Bridge, and a host of other art works and utilitarian objects. Pop and material culture lovers will swoon over the 410 illustrations (55 in full color) and the erudite essays.